When you heat your car in the winter, particles and allergens can clog up your cabin air filter. Keep your air clean and lungs free with our cabin air filter replacement service for as low as $54.95 at Eddy's Toyota. Our highly trained service technicians will replace your worn air filter with a new OEM cabin air filter to boost your heater and keep your cabin free of contaminants. With this inexpensive service, you'll be protecting your lungs and improving the performance of your heater. 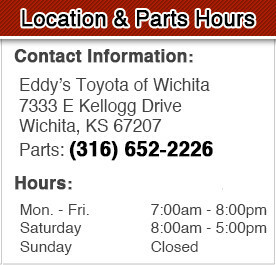 Warm up and breathe easy this winter when you print off this coupon and take advantage of our cabin air filter replacement at Eddy's Toyota in Wichita, KS.